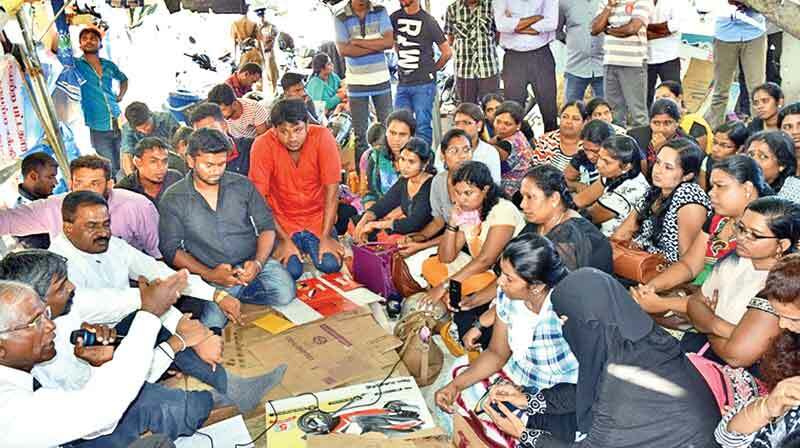 The parliamentary select committee appointed to find solutions for the issues of the unemployed graduates who are in protest over a month at the Gandhi Park in Batticaloa, met the protesters yesterday and discussed the issues with them. The committee comprises Prof. Arshu Marasinghe, Asoka Priyantha, K. Kodeeswaran, and G. Srinesan. The issues of the unemployed graduates were raised in parliament recently by TNA Ampara district parliamentarian K. Kodeeswaran. The Prime Minister Ranil Wickremesinghe in response suggested a parliamentary committee to go in to the issue. The graduates said they were given assurances in the past as well but nothing happened. Therefore, they said they demand a written assurance or will continue the protest.